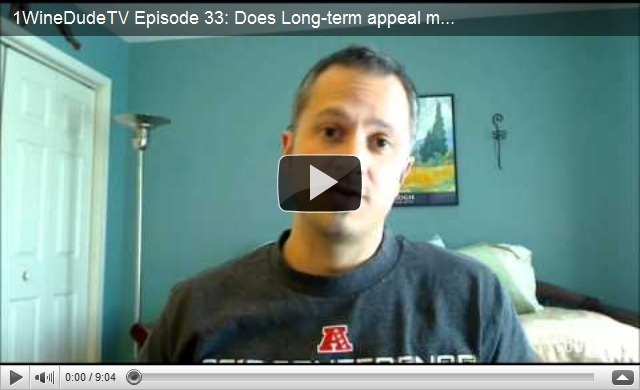 1WineDudeTV Episode 33: Does Long-term Appeal Matter In Wine Writing? In this episode, I drink expensive bubbly, muse on the Royal Wedding, wax pseudo-philosophic about the Georges Duboeuf Wine Book of the Year Awards, and pose the questions: What does “long-term appeal” mean to YOU when it comes to wine writing? And do you think it even matters? Shout it out in the comments! Enjoy! nothing quite like an expensive glass of Champagne or wine sitting in your bedroom in the middle of the day ;). Jerry – that's about the *only* thing Colt 45 and Pol Roger have in common! Thanks for the nod on the genuineness – I try to keep it real (as real as a short Italian-American Caucasian male can keep it, anyway!) and always (deeply!) appreciate when it resonates with someone. Cheers! While the "long-term appeal" of online material is up for question, there is no dispute that the content will be available through searches and archiving for a long time. Much like your running back's recent twitter postings, people who thoughtlessly make statements on the internet will find that you cannot simply erase them. I know this does not address exactly what you are asking. Much of what you do is similar to news reporting. How much long term appeal can there be with a "news" story or even a commentary of a current event? Add to the fact that each year there is a new vintage that can be entirely different from past years product. The wine business is more transitory than it is written in stone. It is ironic that a craft that has so much history and tradition be subject to so many annual changes. Thanks, Perry P – feels like some sort of poetic tragedy, doesn’t it? :) As for our running back – ugh, we didn’t need any more off-season distraction! I think the personality of a wine reviewer should show in their writing. A writer like Jancis isn't going to review or write about wine like Alan Meadows or Steven Tanzer. 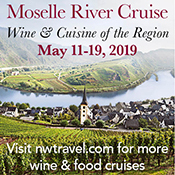 To me, longevity is allowing that writer's view of wine/grapes/wine culture show through whether or not the information remains valid "dozens" of years down the road. As for blogs, even though the longevity of any post quickly dissolves into the ether of the internet, a well-written, engaging, and honest post can create the same impact/impression on a reader that stays with them for many years. That's been my experience at least as a novice wine enthusiast/reader. Thanks, Adam – sort of like the voice lives on, even if the topics don't. The mere fact that online texts are searchable makes it so much easier for a reader to return to your text whenever he or she needs to look something up weather it be tasting noter, grower profiles, or whatever. As a online writer you have the opportunity to update your texts whenever relevant – you can't do the same with a book or a printed magazine. You even have the opportunity of making the development of a certain topic transparent to your readers. … so, as long as you keep on providing high quality content, I'm sure your texts will last and offer value for at least as long as any printed wine publication. Keep up the good work and thanks for an always interesting and inspiring blog. On the Internet, nothing ever really dies (including our spelling errors). Writing of any kind can also have long term value when it somehow causes the reader to change in a lasting way. This could be a relatively minor change such as exposure to a new variety, producer, etc. that the reader tries and comes to love longer term. Or it could be a step change where the writing resonates with the reader in such a way as to cause a major shift in how they perceive the role of wine in their lives. IMHO, blog writers have a unigue ability to go for this type of lasting change in the reader because they have so much freedom in what they choose to write about, how often they write and how they choose to write. Choose a goal and then choose a custom approach to achieve that goal for the reader….and you can change the goal and the approach anytime you want. Everyday is a new game. Wee Ree San – pretty deep (as always! :-). To me, it's like being the Mystery Science Theater 3000 of wine writing – instead of resonating with a large audience superficially and temporarily, I'd MUCH rather resonate deeply with a smaller audience for a longer period of time.Cheers! "What does “long-term appeal” mean to YOU when it comes to wine writing? And do you think it even matters?" Long-term appeal is incredibly important in relation to ANY kind of writing. People tend to come back for more if they like what they've read. But with regard to wine writing in particular, it's sorta like movie reviews; you find a few good reviewers/writers whom you generally agree with and respect (or simply find amusing) and you keep coming back to them again and again. Thanks for the great site, by the way! Thanks, All-American! Sounds like, in a way, you're saying the quality and voice are what makes the long-term appeal. I agree – when I think of the writers that keep me coming back (Hugh Johnson, for example), it's not usually individual pieces of writing as much as it is the overall quality, the entire package of their talents. Cheers! I agree, it's all about the quality and voice. And finding a writer you can relate to on multiple levels. Also, I do think people are generally (including myself) lazy and/or strapped for time, so they're more likely to find a writer they like and stick to him or her. Exploring cyberspace for more authors and fresh new voices takes too long since there are, for example, a crap loads of wine writers out there now! What's funny is that I'm a professor and write a higher ed column as well and it's true in the academic writing world as well. Readers either like my column/classes, and come back regularly, or they don't. So you sorta have to do your thing and see who responds. 1WineDude, I just found your Blog and I think it is excellent, so I am short time reader but will be a very frequent visitor. I find long-term appeal to be very important in a writer or reviewer, but my definition of "appeal" is that the writer is clear, succinct and shows a bit of their personality in their work. Most important to me is that over time they can be trusted to give you a very clear picture of the subject, or in the case of wine reviewers the wine being reviewed. It is not that in the long run you always agree with them, but that they make you a more informed consumer. I like Parker, for example, not because I like all the same wines he does, but because I can read his reviews and if I buy the wine I am never surprised by what I get. The opposite end of the trust spectrum to me is Laube, where I find any similarity of what I experience in the glass, and his review and description, to be coincidental. So I continue to follow the Advocate but dont pay much attention to Laube's reviews or articles. Thanks MPS! Another shout-out to developing your own palate and *then* following the critics that align most to yours. Cheers!